Ulthera aesthetic ultrasound is the latest treatment available for skin tightening of the face. 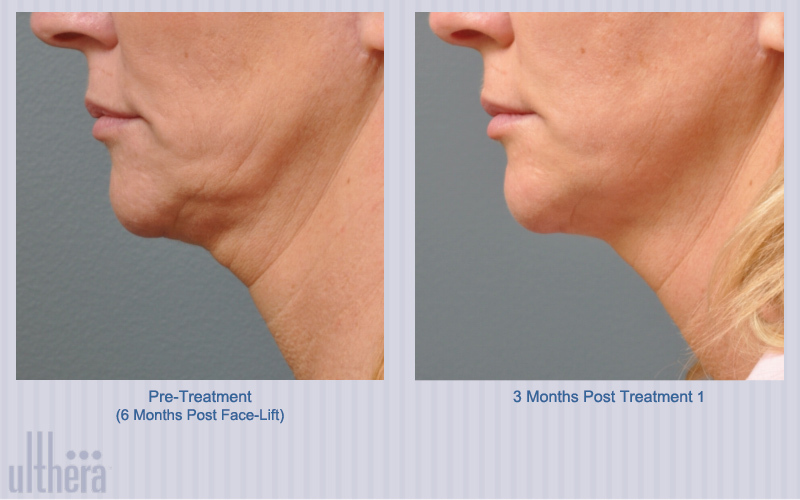 Not an injection, not laser or light, the Ulthera System utilizes ultrasound technology to first visualize then tighten the skin and deeper soft tissue. In clinical evaluation at Northwestern University, subjects exhibited clinically significant, aesthetically pleasing lift of the brow line after just one treatment. They reported firmer, tighter skin in other areas of the face and neck as well. Ultrasound, trusted by doctors and expectant mothers everywhere for decades, now adds a new dimension to aesthetic medicine. Daniel Barolet, M.D., an expert from the University of Montreal’s McGill University was quoted saying “Ultherapy is a quantum leap in skin tightening treatments. One advantage with Ultherapy is that you can go deep with ultrasound, which you cannot do with other technologies such as lasers or radio-frequency.” Ultherapy is also safe for all skin types, no matter how dark, since the technology uses sound waves, there is no risk of hyper or hypo-pigmentation. We are currently the only practice in the state of Nevada that offers this cutting-edge technology. You will be amazed at the results which comes to you at a fraction of the cost of performing a facelift.